Yesterday I attended an “ondernemers beurs” in Escamp, an area within the Den Haag city council limits (in The Netherlands). 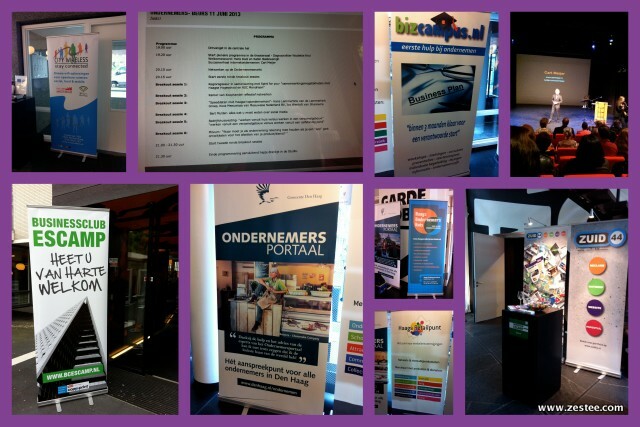 Supported by the government (Gemeente Den Haag) and local businesses who form the Businessclub Escamp, this was an evening event with a small beurs (expo) for ondernemers (business owners) and some presentations and workshops. If you’re new to this website & blog, I’m an Australian with a Dutch husband. After several years of operations in Australia, I relaunched Zestee here in The Netherlands on 01 January 2013 after we relocated mid last year. Though I’ve started to find my place – and several clients – within english speaking expat circles, I find it important to continue to challenge myself to establish myself within the Dutch business community as well. I’d class my Dutch language skills as intermediate and was pleased to be able to follow probably 95% of what was being said in the presentations and workshops at this event. Networking can be difficult in Dutch as I often cannot express myself as clearly as I would like, but find that most Dutch people are quite happy to be patient with my attempts at the language! In fact, I receive many compliments on my language skills which is encouraging, though I know my grammar and vocabulary could certainly do with some improvement. Many will offer to speak English, but as one of my business and personal goals is to become more fluent in Dutch, this will defeat the purpose. The venue was great – Zuid 57 uses the byline “Kunst en cultuur, ontmoeten en ondernemen” (Art and culture, meeting and doing business) and having all of these activities all in the one location makes it a dynamic, interesting space. From where I’m currently based in another area of Den Haag (in Ypenburg) it was about a 20 minute drive. With around 200 attendees, it was a busy evening, starting with registration, organised by evite. They were also a partner at the Ondernemers Ontbijt I attended earlier in the year and again I was impressed with their professionalism. Our badges were printed upon arrival, with the confirmed workshops on the back. Then, we were all ushered into the theatre area and enjoyed a presentation by the key partners. The MC was Nicolette Krul and I really liked her style and confidence. As a non-native Dutch speaker, I found her clear voice easy to understand and it made sense when she explained she was a radio presenter for Den Haag FM! There was a speech from Henk Kool who is the Wethouder van Sociale Zaken, Werkgelegenheid en Economie (Minister for Social Affairs, Employment and Economy). 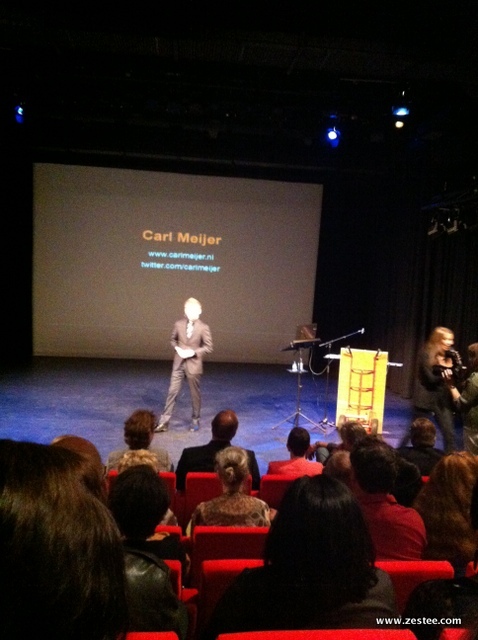 Keynote speaker was Carl Meijer . A young entrepreneur, who is now 24 and who registered his first business at 16, he started and ended his presentation with a great home video of his “vegetable store” when he was around 6 or 7. Goes to show the entrepreneurial spirit can start young and I enjoyed his interesting story. I even managed to follow it all (he presented in Dutch) and even ask my first ever question from the audience on a microphone in Dutch! A little nerve-racking but I thought it was a good opportunity to throw myself in the deep end of truly networking in a new language. I asked him about tips for doing business with other cultures, as he mentioned travelling to China to do business there and how things were different than he first expected. His advice was essentially “just do it and learn as you go!” I’ve found that is pretty much the spirit behind most successful entrepreneurs and try to apply this myself. We then split into a number of workshops. My first one was “Effective Networking” though I wasn’t off to a good start, I got a bit lost and arrived late! I was pleased to see a familiar face presenting, I’d met Bert Wams last year and his simple but effective networking tips were useful, as was the group discussion afterwards. Bert reminded us to work on our “elevator pitch” (they use the english phrase in Dutch!) as well as keep in mind your purpose, with who you’d like to connect and looking for win-win situations. Overall, though I was a little apprehensive at first about networking in Dutch, I enjoyed the evening and made some interesting connections. As I’m based in another area of Den Haag and am already a member of a few other networking groups, I will not be joining the Businessclub Escamp but do find it a great idea that every now and then each region hold a large event like this to “cross network”. Thanks to the organisers for an enjoyable and useful evening. This blog is written by Renee Veldman-Tentori, on topics relating to Social Media, Marketing & Photography. You can read more about me or browse the Zestee website for more information on products and services, such as our popular Social Media School. Like to be kept up to date? Sign up for our e-newsletter on the right hand side of this blog post. You might also like to join the Zestee Facebook community. Yes, I enjoyed talking to you too! Sorry I haven’t left a message sooner. Are you coming to BC Esamp more often?